In the past, we've discussed how any film fan worth their weight in movie tickets should long to see movies which do something different and strive to be original. While the cineplexes are overrun with sequels, remakes, and copycats, we should be searching for something which strives to be unique and shows us something which we've never seen before. This is a noble pursuit, but films which fit this description often wind up being too experiment or weird. We want something outside of the mainstream, but not too far outside. 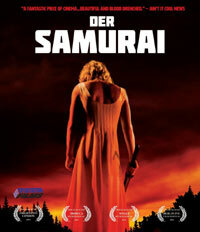 So, enter Der Samurai, a movie which is jarring original, but feels just familiar enough to pique our interest. Der Samurai takes place in a small, quiet town where Jakob (Michel Diercks) is a police officer. His typical night involves telling partiers to keep it down and going home to the house which he shares with his mother. The most exciting thing which has happened to Jakob is that he's been attempting to deal with a wolf which has been spotted around town. One night, Jakob receives a mysterious phone call concerning a mysterious package which he had received. He takes the package to a dilapidated house on the edge of town, where he meets a man (Pit Bukowski) wearing a long, white dress. The man thanks Jakob for delivering the package and then opens it to reveal a samurai sword. The man then flees from the house and begins to cut (literally) a swath of damage through the town, with Jakob in pursuit. As the samurai destroys property, kills people, and shows a true lack of fear or conscience, Jakob begins to question his life. Well, there's one thing that I can say for Der Samurai - I've certainly never seen that movie before. Writer/Director Till Kleinert has certainly stumbled into David Lynch territory with this film, as it opens with a seemingly normal situation and then steadily gets weirder and weirder, entered a world where violence and chaos are the norm. The movie strikes an odd balance of appearing normal in many ways, and featuring some characters who do and say everyday things, while also presenting us with a plot which nearly defies logical description. Something else that I can say is that the first half of the film is very impressive. We've seen plenty of movies based on video games, but Der Samurai is one of the few which made me feel like I was watching a video game, and that is meant as a compliment. I don't know if this was intentional on Kleinert's part, but the first chase between Jakob and the samurai felt like something from a Resident Evil or Silent Hill game. Jakob chases the samuri through the forest with only a flashlight to light his way -- this felt like it came straight out of Silent Hill. Ditto for the following scene in which Jakob consults a map of the town in order to continue the pursuit. From this point, Der Samurai becomes a little too inscrutable for its own good. The story is intentionally vague, which would be fine if it stayed on the path of simply being an odd action movie. But, in the second half, the viewer can't help but wonder what is going on here. I'm not giving much away by saying that we never learn who the samurai is, why he came to the town or what his motivations are. He's just a crazy guy on a path of destruction. (Which means that some in the audience can place interpretations on the character, but we won't go into that here.) Similarly, Jakob's action become hard to read in the second half. It appears that he admires the samurai (perhaps for his freedom?) and that he may also be attracted to him. Is this simply because he's in a dress? Is there more? While the movie doesn't answer these questions, the second half does offer plenty of violence and at least one tense scene. The finale is somewhat shocking, but also a bit pedestrian. Problems aside, Der Samurai is an impressive feature film debut for Kleinert. He clearly has an eye for action and isn't afraid to present us with some odd imagery. The movie may be too vague for its own good, and I couldn't stop thinking that Diercks looks like a German Chris Klein, but there's no denying that it held my attention. The film walks the fine line between arthouse and grindhouse that we don't see often enough. And while it's not completely successful the movie is worth checking out for the first half alone. Der Samurai shouldn't have chosen a white dress for his adventures on Blu-ray Disc courtesy of Artsploitation Films. The film has been letterboxed at 1.78:1 and the Disc contains an AVC 1080p HD transfer which runs at an average of 25 Mbps. The image is sharp and clear, showing no distracting grain and no defects from the source materials. The colors look good and natural. The image is never overly dark or bright, which is important, as there are some dark moments here, but the action is always visible. The picture is a bit soft at times, but the depth is good. The Disc carries a DTS-HD Master Audio 5.1 track which runs at 48 kHz and an average of 4.5 Mbps. The track provides clear dialogue and sound effects. The stereo effects are fine and show good separation. The track really shines during the chase in the woods, as we get sounds coming from the sides and the rear. The Der Samurai Blu-ray Disc contains only a few extras. We begin with an AUDIO COMMENTARY with Director Till Kleinert and Producer Linus De Paoli. "Behind the Scenes Featurette" (11 minutes) contains still images, concept art, film clips, and on-set footage, which is accompanied by commentary from Kleinert. He talks about ideas for the film, the location, and then examines specific, individual scenes. The concept art of the Samurai is decidedly creepy. The final extra is a TRAILER for the film.